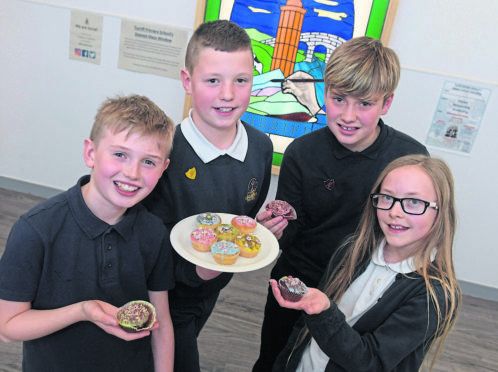 Turriff Primary School tea party to mark the first anniversary of their official opening. From left, Charlie Greig, Mathew Gove, Nicol Dall and Logan Dibben. Picture by Kath Flannery. Pupils at a north-east primary school have celebrated the first anniversary of the opening of their new facility. Turriff Primary School pupils were treated to a cupcake each and given a fun end to the day yesterday with dancing, music and quizzes. The building was officially opened by Aberdeenshire Provost, Bill Howatson last year. All 18 classes marked the occasion in a different, age-appropriate way, with everybody getting the opportunity to enjoy music and cake. Acting head teacher Fiona Eaton confirmed it has been an exciting year. She said: “At Markethill, we didn’t have a separate gym hall and dinner hall, like many schools, but now we have, so it’s been great having both facilities to use at the same time. “There have been way more opportunities for learning and teaching with the new layout – having doors between each classroom means there’s more cooperative and team teaching too. “We just have such a feeling of space and it’s a great place to work in. It has been a fantastic year. “Our four house captains organised this celebration and although it’s not a massive party with the whole school and has been done class by class, it’s still a big undertaking for the group. The four house captains, Logan Dibben, Charlie Greig, Nicol Dall and Mathew Gove, explained the highlights of their new school. Nicol added: “We can go on the astroturf at break and lunch so we get to play football with our friends. Local councillor Alastair Forsyth described the school as a fantastic asset. He said: “The school is a focal point for the Turriff community. “I am delighted to say that every time I visit the school, I find the staff and children in great spirits.